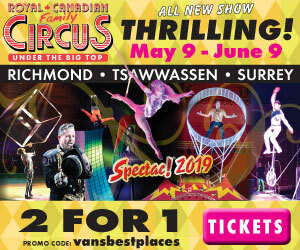 There are so many free things to do in May in Vancouver including Victoria Day celebrations, Ladner May Days, markets and other fun activities. In May there are also night markets, food truck festivals, parades, the BMO Marathon to watch, and a number of other free fun events. See below for details. For a list of May events including activities that aren’t free, click May Events Calendar. For a list of FREE (and almost free) activities and events this month, see below. In addition to checking out all the free activities listed below on specific dates, click Vancouver on a Budget for a list of great activities that don’t cost a lot of money throughout the year. Note: schedules are subject to change – check official websites for exact details. Vancouver Art Gallery – admission to the city’s main art gallery at 750 Hornby Street is by donation today between 5:00 and 9:00 pm. Cheap Movie Night – at most Metro Vancouver cinemas (so it’s not free, but it is extra cheap). Lower Mainland Parks – if good weather, various parks and places in nature are “best places” to be! Lower Mainland Parks – if it’s nice out, then enjoy the outdoors in one of the region’s best parks and places in nature. Darts Hill Garden – a semi-private garden in South Surrey that’s open by donation between 11:00 am and 3:00 pm. CityFest – a skateboarding festival with free live entertainment and other youth-oriented activities in North Vancouver. Cinco de Mayo at Lonsdale Quay – Nahualli Folklore perform traditional Mexican dances in the Market Rotunda from 1:00 until 2:00 pm. Abbotsford Farm and Country Market – opening day for market between 9:00 am and 1:00 pm in downtown Abbotsford. Burnaby Artisan Farmers Market – at Burnaby City Hall from 9:00 am to 2:00 pm. Fort Langley Farmers Market – from 10:00 am until 3:00 pm in Fort Langley. Lonsdale Artisan Farmers Market – a tiny market at North Vancouver’s Lonsdale Quay from 10:00 am until 3:00 pm. Riley Park Farmers Market – a market with around 30 vendors at 50 East 30th Avenue across the street from Nat Bailey Stadium between 10:00 am and 2:00 pm. Squamish Farmers Market – in downtown Squamish between 10:00 am and 3:00 pm. Trout Lake Farmers Market – a large market at the north end of Trout Lake from 9:00 am until 2:00 pm. North Vancouver’s Shipyards Night Market – market activities and a free concert from 5:00 until 10:00 pm not far from Lonsdale Quay. Family Favourites Movies – the movie Ferdinand costs just $2.99 in the morning at select theatres in Abbotsford, Burnaby, Chilliwack, Coquitlam, Langley, Pitt Meadows, Richmond, Surrey and Vancouver. Vancouver Marathon – a major sporting event with close to 18,000 runners (who pay to participate) and live music along the way (which is free to enjoy). Memorial Parade – a small military ceremony at 10:00 am at Waterfront Park in North Vancouver to commemorate the end of the Second World War’s Battle of the Atlantic in which over 4600 Canadians lost their lives. Poirier Street Farmers Market – a market at Coquitlam’s Dogwood Pavilion at 624 Poirier Street between 9:00 am and 1:00 pm. Ambleside Artisan Farmers Market – in West Vancouver at the foot of 13th Street just inside the entrance to Ambleside Park between 10:00 am and 3:00 pm. Kitsilano Farmers Market – between 10:00 am and 2:00 pm at the Kitsilano Community Centre. Steveston Village Farmers Market – at the Steveston Community Centre at 4111 Moncton Street between 10:30 am and 3:30 pm. White Rock Farmers Market – at 15154 Russell Avenue from 10:00 am to 2:00 pm in White Rock. Cloverdale Flea Market – a giant market with primarily (but not exclusively) second-hand goods between 6:00 am and 3:00 pm in Surrey. Admission is $1.50, but free for kids ages 12 and under. Vancouver Art Gallery – cost today is by donation between 5:00 and 9:00 pm (but regular price at other times). Cheap Movie Night – at most Lower Mainland cinemas (so films aren’t free, but they are extra inexpensive). Spot Prawn Festival – at False Creek’s Fishermen’s Wharf at 1505 West 1st Avenue. Access to the Spot Prawn chowder area costs money, but the rest of the venue doesn’t. Chilliwack Food Truck Festival – a food truck event featuring 3 dozen or so food and artisan vendors at Chilliwack Heritage Park in the Fraser Valley. Abbotsford Farm and Country Market – between 9:00 am and 1:00 pm in downtown Abbotsford. Haney Farmers Market – at the Memorial Peace Park in Maple Ridge between 9:00 am and 2:00 pm. Family Favourites Movies – the movie Jumanji costs $2.99 in the morning at select theatres in Abbotsford, Burnaby, Chilliwack, Coquitlam, Langley, Pitt Meadows, Richmond, Surrey and Vancouver. Playland – the city’s amusement rides and midway are open between 10:00 am and 6:00 pm (with a chance that admission is free for moms arriving within a specific period of time – or at least that’s been the case other years). Music on the Bow – a mini concert at the Trout Lake Community Centre at 3360 Victoria Drive. Tonight features the Soda Crackers from 7:00 until 9:00 pm. Beaty Nocturnal – admission to UBC’s Beaty Biodiversity Museum is by donation today between 5:00 and 8:30 pm. Whistler Go Fest – the “Great Outdoors Festival” today features free street entertainment throughout the afternoon in Whistler Village and a free concert starting at 7:30 pm in the Village Square. Cloverdale Rodeo and Country Fair – the rodeo’s shows, amusement rides and admission to the fairground aren’t free, but the parade between 10:00 am and noon is. Whistler Go Fest – the “Great Outdoors Festival” today features a variety of free activities including concerts in the Village Square starting at 3:00 and 7:30 pm. Vancouver Comic Arts Festival – an event for people who love comics. Admission is free, as are most (but not all) of its activities. Whistler Go Fest – the “Great Outdoors Festival” today features all kinds of free activities including free concerts in the Village Square starting at 3:00 and 7:30 pm. All-British Vancouver-Whistler Run – up to 100 or so classic British cars are on display at Whistler’s Creekside Plaza as part of the Whistler Go Fest event. Royal Victorian Party – free Victoria Day festivities at Surrey’s Stewart Farm. Engine 374 Anniversary Celebration – free birthday cake, kid-friendly activities and a brass band from 12:00 until 3:00 pm at the Roundhouse Community Centre to commemorate the 1887 arrival of the first passenger train in Vancouver. Cloverdale Rodeo and Country Fair – the rodeo’s shows and amusement rides aren’t free, but the pancake breakfast is available for a minimum $3 donation and attendees arriving between 9:30 and 9:59 am get free admission to the country fair. Kitsilano Farmers Market – between 10:00 am and 2:00 pm at the Kitsilano Community Centre at 2690 Larch Street. Whistler Farmers Market – between 11:00 am and 4:00 pm at the bottom of Blackcomb Mountain. 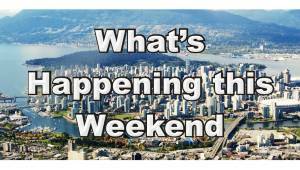 Victoria Day – the statutory holiday day of the May Long Weekend. Victoria Day at Burnaby Village – entertainment with the Tiddly Cove Morris Dancers and British Columbia Regiment Band, plus various family-friendly activities. Victoria Day at TLCC – activities for little kids and their families at the Trout Lake Community Centre from 10:00 am until noon. Free with advanced registration. Whistler Go Fest – a “Great Outdoors Festival” which includes free yoga in the morning and live entertainers in the streets of Whistler Village. Fort Langley May Day Parade – a large parade along Glover Road followed by a small fair with family-friendly activities at Fort Langley Community Park. Music on the Bow – a mini concert at the Trout Lake Community Centre at 3360 Victoria Drive. This afternoon features the Blue Lasso Band from 1:00 until 3:00 pm. Surrey International Children’s Festival – a festival for children at Bear Creek Park and the Surrey Arts Centre. Admission to the site is free, but shows and most activities require payment for tickets and a wristband. Ladner May Days – a community fair at Memorial Park. The amusement rides cost just $2-$4 each (but today only), and the live music and admission to the site are free. Surrey International Children’s Festival – a festival for young children at Bear Creek Park and the Surrey Arts Centre. Admission to the site is free, but shows and most activities require payment for tickets and a wristband. Ladner May Days – a community fair at Memorial Park. The amusement rides cost money, but the live music and admission to the site are free. 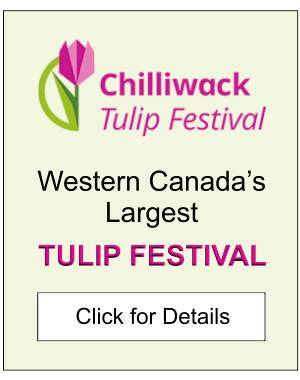 Hyack International Parade – a large parade in downtown New Westminster beginning at 11:00 am. Uptown Street Fest – a street party event along New Westminster’s Belmont Street between 11:00 am and 5:00 pm. Coquitlam Food Truck Festival – a food-focused event with food vendors at Town Centre Park from 11:00 am until 5:00 pm. The food isn’t free, but admission to the venue is. Glades Garden Open House – the semi-private garden park is open between 10:00 am and 3:00 pm at 561-172nd Street in Surrey. Admission is by donation. Lonsdale Quay Farmers Market – a tiny market at North Vancouver’s Lonsdale Quay from 10:00 am until 3:00 pm. 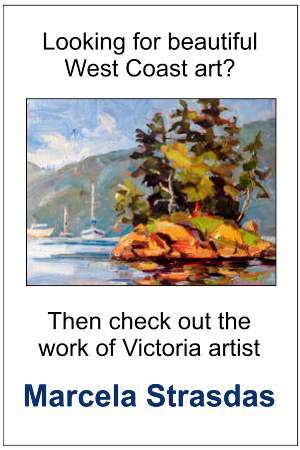 West End Farmers Market – at 1100 Comox Street between Thurlow and Bute from 9:00 am until 2:00 pm. Ladner May Days – a community fair at Memorial Park. The amusement rides cost money, but the live music and admission to the site are free. Today is also the day for the parade starting at noon. Dano-Korean Festival – a free event featuring various Korean cultural activities between 11 o’clock and 1 o’clock at the Trout Lake Community Centre. Vancouver Turkic Festival – a live music and family-friendly cultural activities at Shipbuilders’ Square in North Vancouver. Paper Collectibles & Postcard Show – the Vancouver Postcard Club’s annual Show & Sale event takes place at the Hastings Community Centre from 10:00 am until 4:00 pm. Admission is by donation. Bike to Work Week – a good day to commute to work using pedal power! It’s free and good for you! Music Mondays – free live music featuring musicians from the area between 5:30 and 6:30 pm at Sunset Community Centre at 6810 Main Street. Bike to Work Week – a good day to commute to work using pedal power! Sounds of Spring – a free live music event at Blackie Spit in Surrey between 6:30 until 8:00 pm. Museum of Vancouver – admission is by donation today between 5:00 and 8:00 pm. For a more complete list of things to do in May, including activities that aren’t free, see Vancouver’s May Events Calendar.